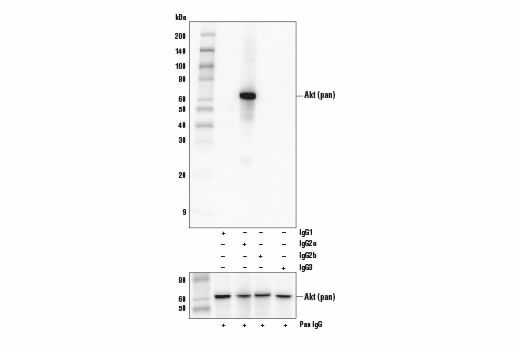 Western blot analysis of various cell lines and recombinant Akt1, Akt2 and Akt3 proteins using Akt (pan) (E7J2C) Mouse mAb. Recombinant Akt1, Akt2 and Akt3 each contain an N-terminal 6XHis and FLAG-Tag, MW=66kDa. Western blot analysis of C2C12 cell extracts using Akt (pan) (E7J2C) Mouse mAb as the primary antibody. Various anti-mouse isotype specific antibodies (upper) and Anti-mouse IgG, HRP-linked Antibody #7076 (lower) were used as secondary antibodies. Immunoprecipitation of Akt protein from Jurkat cell extracts. Lane 1 is 10% input, lane 2 is Mouse (E5Y6Q) mAb IgG2a Isotype Control #61656, and lane 3 is Akt (pan) (E7J2C) Mouse mAb. 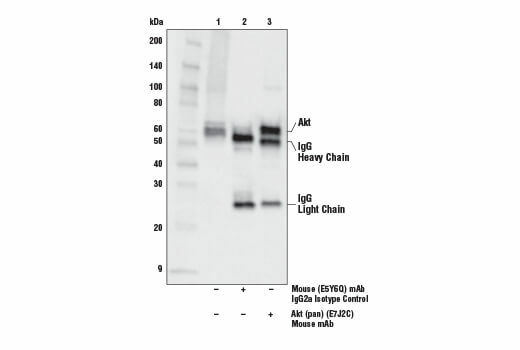 Western blot analysis was performed using Akt (pan) (E7J2C) Mouse mAb. 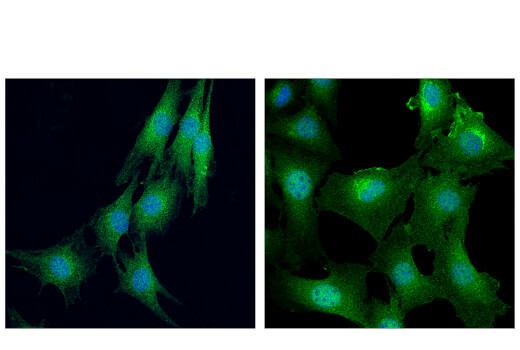 Confocal immunofluorescent analysis of C2C12 cells, treated with LY294002 #9901 (50 μM, 2 hr; left) or insulin (100 nM, 20 min; right), using Akt (pan) (E7J2C) Mouse mAb (green). Blue = DAPI #4083 (fluorescent DNA dye). Note the translocation of Akt to ruffling membranes following stimulation. 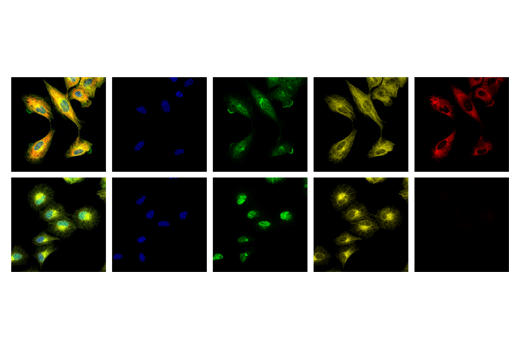 Confocal immunofluorescent analysis of A549 cells, treated with insulin (100 nM, 20 min; top) or LY294002 #9901 (50 μM, 2 hr; bottom) using Akt (pan) (E712C) Mouse mAB (green; mouse IgG2a), α-Tubulin (DM1A) Mouse mAb #3873 (yellow;mouse IgG1), and Phospho-S6 Ribosomal Protein (Ser240/244) (D68F8) XP® Rabbit mAb #5364 (red; rabbit IgG). Samples were mounted in Prolong Gold Antifade Reagent® with DAPI #8961 (blue). Note the translocation of Akt to ruffling membranes following stimulation with insulin (arrow heads). 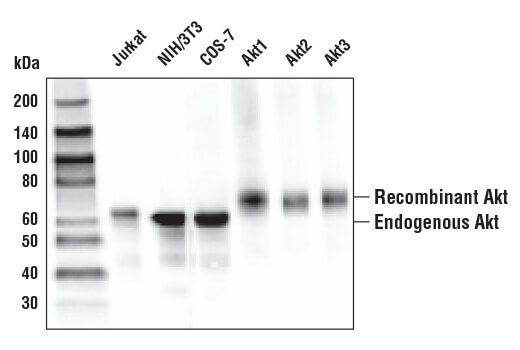 Akt (pan) (E7J2C) Mouse mAb recognizes endogenous levels of total Akt protein. Monoclonal antibody is produced by immunizing animals with a synthetic peptide corresponding to residues near the carboxy terminus of human Akt.